MX4D® Special EFX For “The Avengers: Age of Ultron” Plus Hong Kong A-List Actor Eric Tsang Delight Thongs of Thrill-Seeking Movie-Goers! Mr. Pan, General Manager of Luxin-Rio, said: “It is a milestone that the MediaMation MX4D Motion EFX Theatre is installed in Beijing. This means the new MediaMation Motion EFX Theatre cutting-edge technology is accepted in the Chinese market." Hong Kong silver screen superstar Eric Tsang, MediaMation VP/CTO Dan Jamele, Disney Studio representatives and theatre chain executives from across the great continent of China joined throngs of avid Chinese movie-goers to witness the highly publicized premiere of the first 96-seat MediaMation MX4D Motion EFX Theatre in the capital city of Beijing. The gala event took place May 25, 2015, at the legendary, 80-year old Xidan Capital Cinemas theatre, located in the bustling shopping district of Beijing. It is reported to be the number one-attended theatre in China. 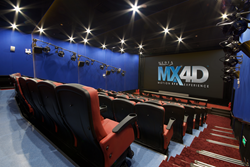 The watershed MX4D Beijing install – the first for major Chinese cinema chain Capital Cinemas – was made possible via the partnership of Torrance, CA, USA-based 4D cinema maker MediaMation, Inc. and Chinese 3D equipment supplier Luxin-Rio. It follows the recent installation by MediaMation and Luxin-Rio of an MX4D 100 + seat theatre in the city of Nanning for Wanda Cinemas, and the announcement of an upcoming installation in Nanchang for Jinyi Cinemas. The main event of the Beijing festivities was the MX4D debut of Disney’s live-action comic book adventure, “The Avengers: Age of Ultron” (known as “Creating Eras” in Chinese.) Movie fans shrieked with excitement when MX4D pitch, heave and roll motion, air and water blasts, scents, leg ticklers, seat poppers and other special effects punctuated the frenetic on-screen action of “Iron Man,” “The Hulk,” and various Marvel superheroes. Sharing their infectious excitement with the television cameras, newly-minted fans of the MediaMation MX4D technology exclaimed their enthusiasm for seeing other MX4D® releases such as “Tomorrowland,” “San Andreas (“DoomsDay Collapse”) and “Jurassic World” in this immersive new cinematic format. Mr. Pan, General Manager of Luxin-Rio, said: “It is a milestone that the MediaMation MX4D Motion EFX Theatre is installed in Beijing. This means the new MediaMation Motion EFX Theatre cutting-edge technology is accepted in the Chinese market. In the future, we see this high-end 4D theatre brand capturing the largest market share in China." MX4D is MediaMation’s uniquely branded “4D” pneumatically driven motion EFX system. In general, 4D refers to an emerging “immersive” cinema technology which allows movie-goers to experience big Hollywood “blockbusters,” as well as locally produced major films, in a new way via the addition of moving seats, air/water blasts, leg/neck ticklers, fog, seat/back pokers, seat rumblers and other special effects that emanate from specially designed theatre seats, or from inside the theatre itself. These multiple special effects are programmed to both sync with and enhance the action on the screen and sounds in the theatre for a more exciting and realistic movie-going experience. About MediaMation, Inc. -- For more than 24 years, MediaMation has provided innovative and visionary technological solutions to the entertainment market. MediaMation is an interactive technology company and a worldwide, leading supplier and manufacturer of patented technology for 4D/5D motion EFX theatres and seats. Besides its MX4D Motion EFX technology and seats, MMI designs and implements creative solutions for complex shows, rides exhibits, fountain shows, etc. for theme parks, zoos, aquariums, museums, cinemas and FECs. From concept to design to installation, MediaMation provides turnkey solutions for creating state-of-the-art 4D theatres and themed environments. For more information, visit http://www.mediamation.com, http://www.MX-4D.com. About Luxin-Rio -- Luxin-Rio is a precision manufacturer of 3D polarized modulator and 3D glasses in China. Luxin-Rio focuses on developing the 3D industry in China, including cinema equipment, theme parks, culture education, entertainment and leisure, advertising, premium home theatre systems and games. In 2013, Luxin-Rio invested in Volfoni, an international company specializing in manufacturing 3D equipment, to form a strategic partnership.